The RD that I work with first recommended Honey Milk to me about 6 months ago. After that, I emailed the company asking to try their products. I ended up really liking the Light Chocolate flavor while my husband loved all of them especially the honey flavor. My hubby kept asking me about getting some more of these so I asked the company if I could review them again. I received a 12 pack of the Honey Milk which retails for $34.99. This product can help to reduce muscle fatigue which is important if you are an athlete. My husband is getting back into running (he ran 5 miles last week!) and will drink these after his runs. The product is high protein and packs 26 grams per bottle!! It has 240 calories, Vitamin A, Vitamin C, and 80% of your daily calcium. What I really like about these drinks is that they taste great and are great nutritionally. This is a rare find with protein supplements. If you have not tried Honey Milk before, I highly recommend it! The giveaway will be for a case of mixed flavors of Honey Milk (a $35 value!!). The giveaway is open until Midnight on Tuesday April 26th. Winner will be chosen on Wednesday April 27th using Random.org. The winner will have 48 hours to respond or a new winner will be chosen. 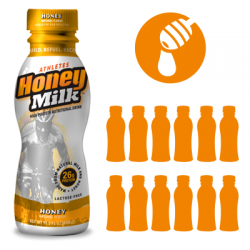 Visit the Honey Milk website and let me know what flavor that you want to try the most! I would love to try the Strawberry Banana. These are two of my favorite fruits. I follow you on GFC as seriousreader. I entered the Ecolips giveaway. Strawberry Banana is the flavor I would like to try the most! I entered the Emani Mineral Makeup giveaway. I entered the If You Care t-shirt giveaway. I'd like to try the Chocolate. Thanks for the review and giveaway! I entered the Everblade giveaway. I entered the Chef's Planet giveaway. I'm a new follower!! I blog at Work From Home Star. I would like to try all the flavors, but especially the Strawberry Banana one. Strawberry Bananna fan all the way. Already subscribe to your blog via email and google connect. i like the vaneilla flavor. no artificial sugars!!! I'VE ENTER THE 'CHEF'S PLANET' GIVEAWAY. I'VE SUBSCRIBED TO YOUR WEB PAGE. I think I would like the chocolate the best. I would try Strawberry Banana. I would like to try the coffee flavor! I *like* you on FB as Cyn Knight! You are also on my blogroll! I'd prefer the Vanilla flavored, also good for adding to a smoothie. I think the strawberry banana flavor sounds great! I entered the Chef's planet kitchen gadgets giveaway! I'd like to try the Chocolate flavor the most, yum! I'd love to try the coffee flavor! Like your Facebook page. Matt S.
Subscribe by GFC. Matt S.
I'd most like to try the light chocolate flavor. I follow your Facebook page (FB name: Maddie Brubaker). I entered the Ozone socks giveaway. I would like to try the chocolate the most. I am a GFC subscriber-danellejohnson. either the light chocolate or the honey look great. Coffee - another favorite flavor besides milk and honey. Now they need a mocha so they can have chocolate in there also. I would like the strabwerry banana. The coffee light sounds good. I entered the Emani giveaway. I entered the If You Care giveaway. Strawberry Banana would be my flavor of choice! I would love to try the chocolate flavor, thanks! I actually want to try the regular Honey flavor the most. Thanks for the giveaway...we would like to try the Vanilla flavor !